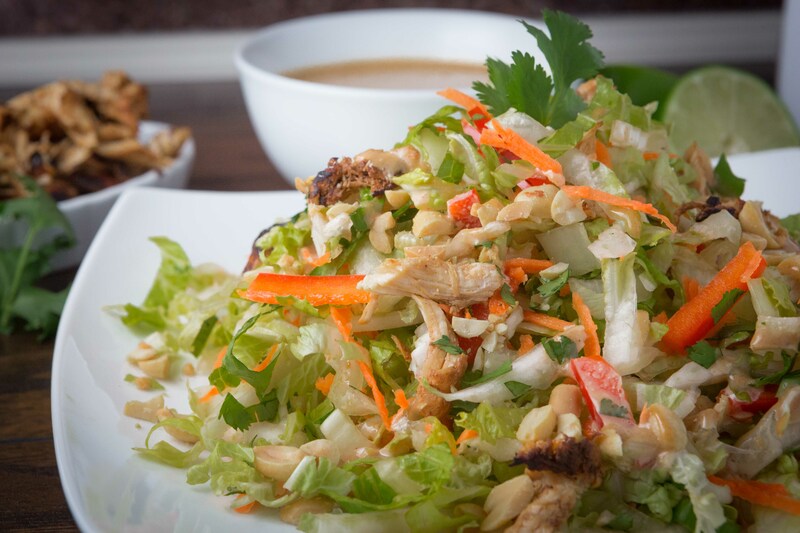 Tender chicken, finely chopped lettuce, Asian cabbage and other veggies, tossed together and topped with crunchy peanuts and thick, creamy Thai peanut dressing. It’s the perfect dose of freshness that we’ve been needing after all of those winter meals. 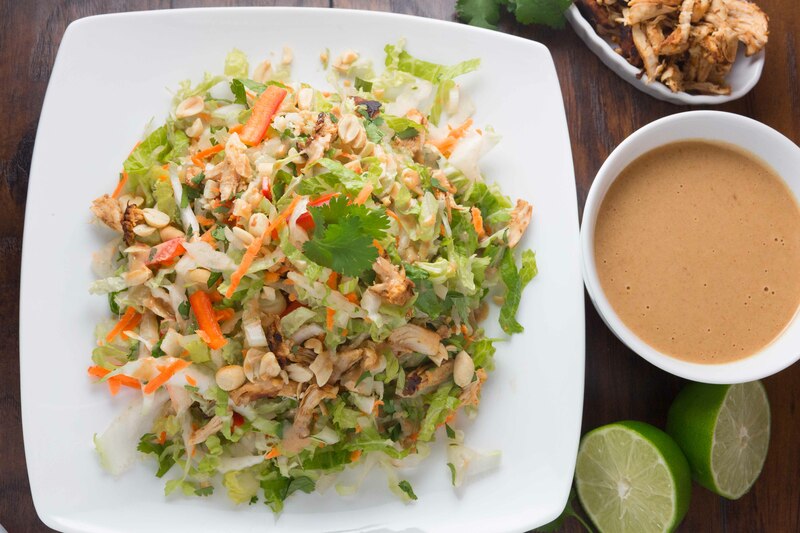 Dive into this Crunchy Thai Chicken Salad, and you can taste the freshness of summer in each bite. Happy Memorial Day weekend! It has already been a very fun weekend around here! 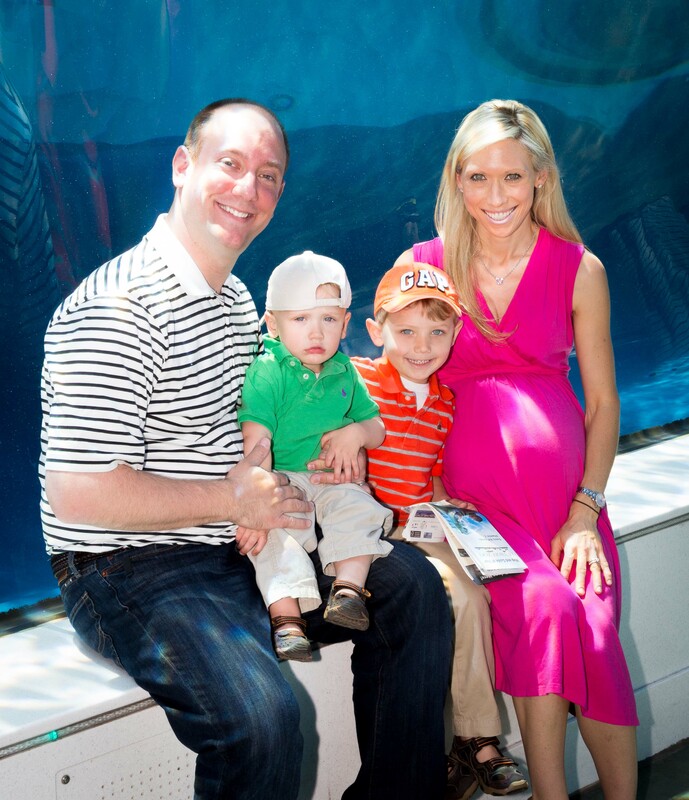 We’re trying to make the most out of our very last weekend as a family of FOUR! Lots of fun, family time, date nights, spoiling our kids, etc. Andrew and I had a great date night out on Friday! Yesterday we headed to the zoo for a little family fun, and after all of that walking around, Andrew treated me to a very relaxing and much needed pedicure. 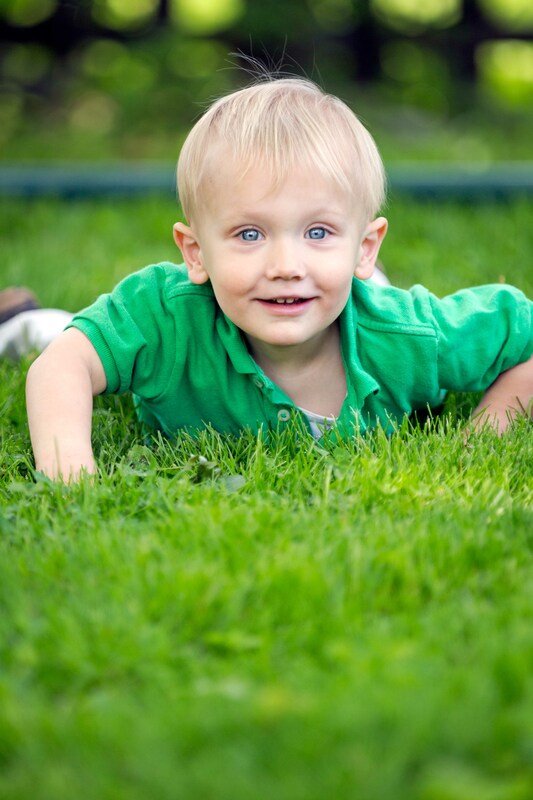 Today we had a great family fun day outside in the yard, playing and goofing around, and then after nap time, headed down to the pool for some swimming and more fun in the sun. Andrew even surprised me again today with two dozen gorgeous pink roses! What a great weekend so far! With all of the blue skies and warm weather, I can’t wait to start enjoying some amazing summer meals. What could welcome the summer better than a fantastic new salad? I have been so excited to share this one!!! A little side note: All of the recipes on my blog are my own, original creations, unless I tell you otherwise. That means that I basically spend a lot of my (few moments of) free time, brainstorming and playing around with recipe ideas and combinations. It also means that sometimes my great ideas just don’t work out, or need a few improvements or adjustments before they’re worth sharing. Sometimes however, I am happy to say that after scribbling and jotting down about 100 ideas for one recipe, there are times when my ideas are successful right off the bat! After seriously researching, and playing around with my ideas for the “perfect” Thai chicken salad, I am thrilled to say that this one is a clear WINNER!!! Dive into this salad and you’ll feel like you’re dinning at a gourmet Thai restaurant. It’s everything that you have always wanted in a Thai chicken salad, but never thought you would ever dream of creating at home. 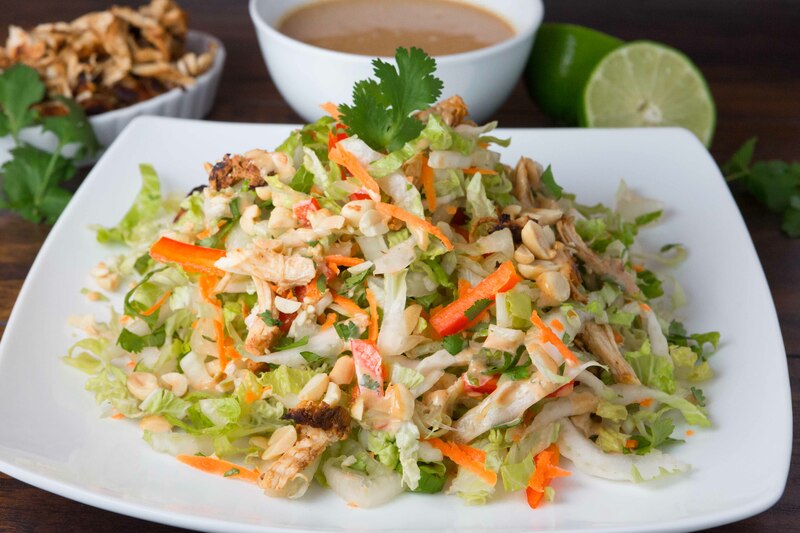 This Crunchy Thai Chicken Salad is an explosion of textures and flavors that are sure to wow your taste buds, and your loved ones! Place chicken in a gallon sized ziplock bag, and add to it: olive oil, honey, lime juice, garlic powder, onion powder, curry paste, and fish sauce. Close bag and shake to combine. Place bag on a clean plate, lined with a paper towel, and allow to marinate in fridge for at least 4 hours or overnight. To assemble the salad, combine the romaine, cabbage, carrots, onions, red pepper, and cilantro in a large bowl and toss together. Set aside or cover and refrigerate until ready to serve. To prepare the dressing, add to a blender: peanut butter, garlic, honey, lime juice, vinegar, water, soy sauce, and fish sauce, and blend together until creamy and smooth. After chicken has marinated, cook chicken in a large non-stick skillet coated with cooking spray over medium high-heat. Cook chicken until no longer pink in the middle, about 5-8 minutes. Move chicken to a clean plate, and once cool enough to handle, pull apart and shred chicken. Place shredded chicken in a clean bowl. 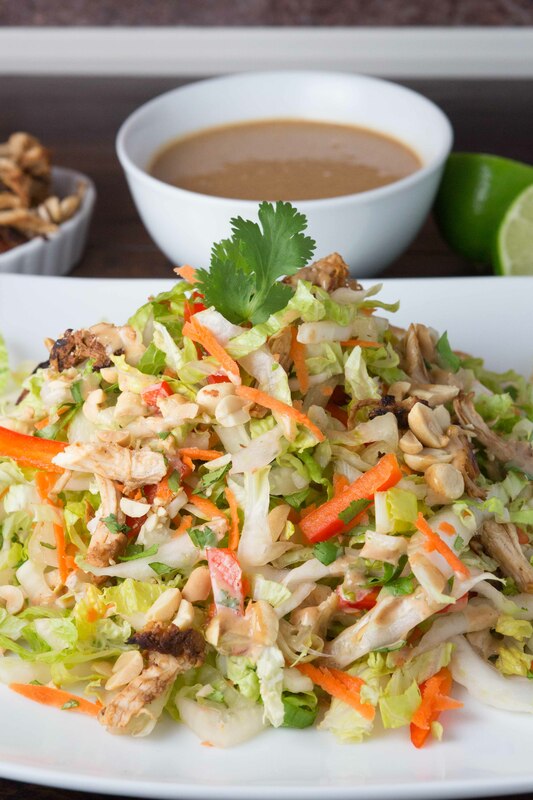 Serve salad topped with chicken, chopped peanuts and cilantro, and a hearty helping of peanut dressing. Enjoy! 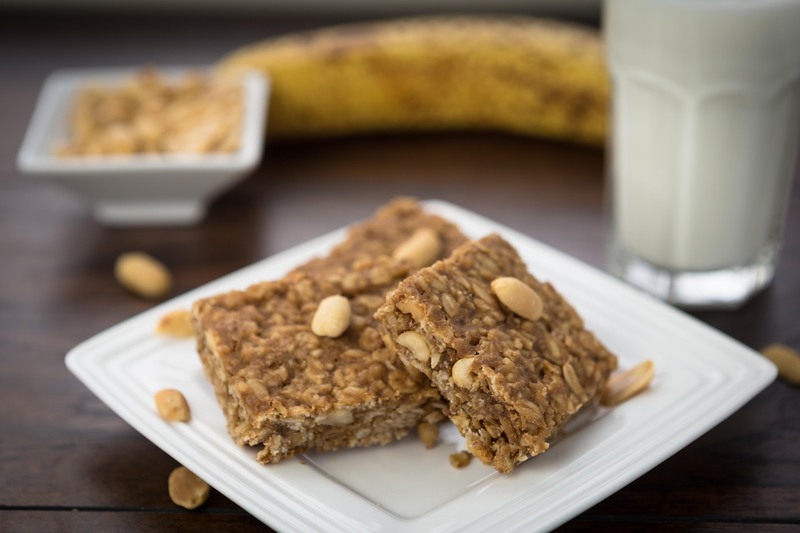 Sweet, peanut buttery, oatmeal goodness, baked into a perfect little bar. 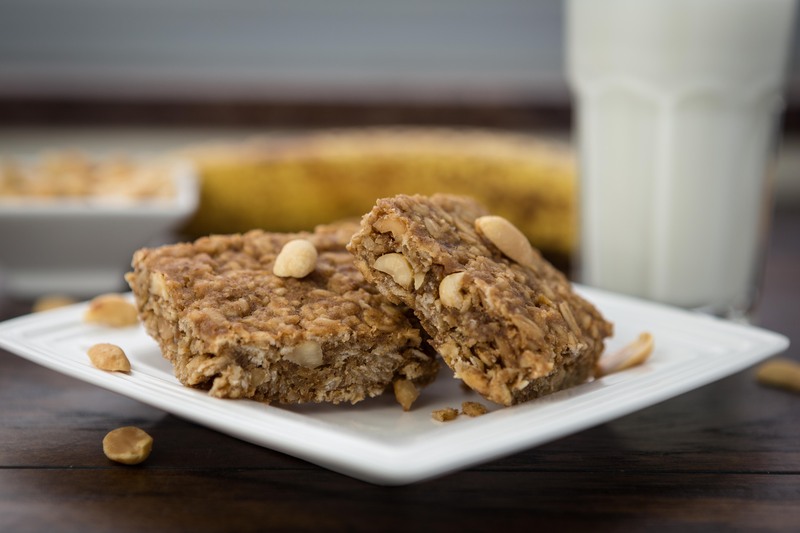 Oatmeal Peanut Energy Bars are bursting with nutritious, “good for you ingredients”. What’s not to love about this delicious treat? This little taste of spring is starting to make me realize that baby boy number three is going to be here before we know it! We only have about 2 1/2 months left until he makes his appearance. Thankfully, I’m not totally in the nesting mode yet, but I can feel it slowly creeping in. Lately, I’ve been more in the “cook all the things!” mode, which I guess isn’t all bad. The days that have been too cold to go outside, the boys and I have had numerous cooking lessons. They are getting to be quite the pair of little sous chefs. Sometimes I’ll cook with both of them, sometimes I’ll try to whip something up alone during nap time, and sometimes I will let William skip his quiet time and we’ll cook together. That’s just what happened here. William and I created this recipe a few weeks ago, before we left for our trip to San Diego. I wanted to come up with a snack that we could all enjoy, that would travel well, and that fell into the “healthy, good for you” category. So, to the kitchen we went. Thankfully, James was napping during our little test kitchen adventure, so William and I could get serious and focus. 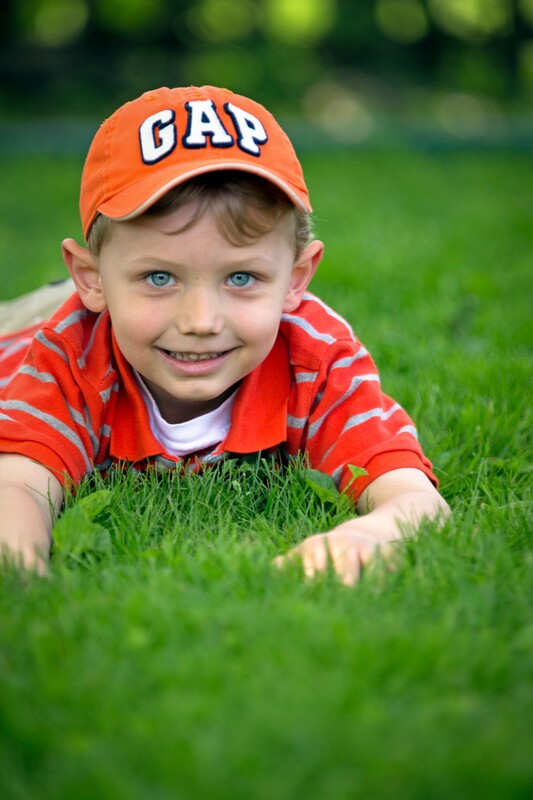 (William has become a wonderful helper! He is not only great at measuring and gathering ingredients, but most importantly, he’s an honest critic!) I remember him saying to me as we were testing the peanut butter mixture for our first batch, “It needs more sweetness”. We kept taste testing and adding to it, until William and I signed off on the final version. We added everything together and stirred it up. Then we added a few more oats and chopped peanuts until we agreed that the consistency looked (and tasted) just right. We popped them in the oven and waited. Once they were cool enough to handle, the boys and I DOVE in full force! Seriously, I think I ate four or five bars without even thinking, and the boys each devoured three! Thankfully, we managed to save a few for Andrew when he came home. His verdict? He was sold after his first bite, and thought they tasted a bit like a peanut butter brownie! When I told him that these bars were actually HEALTHY, he responded with, “We should make these ALL the time!”. Trying to take the advice of my husband, I feel like I have been pretty much making these non-stop. I made a double batch for our San Diego trip, and since we’ve gotten back, I have made at least three different (double batches). I just recently made these a few days ago and we had the chance to share them with both sets of Grandparents. They loved them, too! What a fun little (healthy) treat to share with the ones you love. So, there you have it. Devoured by kids AND adults, and packed with all the right healthy ingredients to give you and your family energy whenever you need that little pick-me-up. 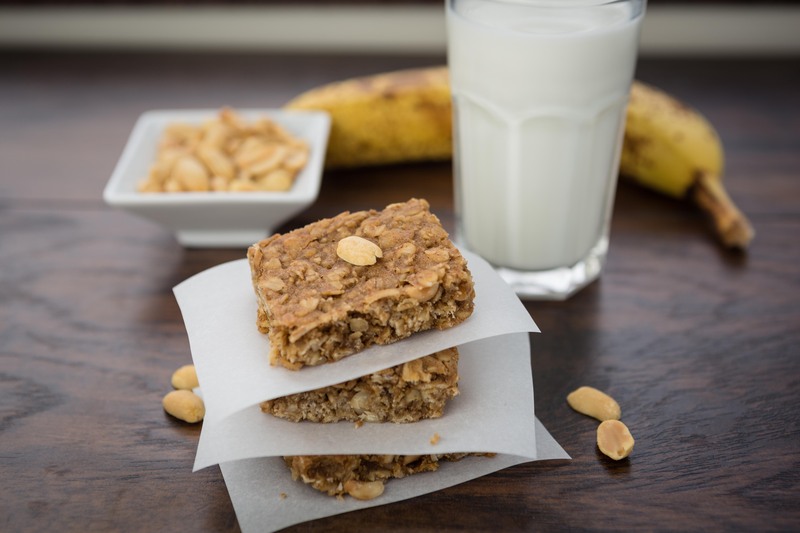 These Oatmeal Peanut Energy Bars are sure to be a hit! Puree dates and 1/4 cup warm water in blender or food processor until mostly smooth. Add peanut butter, banana, water, coconut oil, agave, vanilla, and salt, and process until smooth. In a large bowl, combine oats, peanuts, and baking powder and stir together. Pour peanut butter mixture over oat mixture and stir together until oats are well coated. In a 13 x 9" baking pan, lined with parchment paper (that extends slightly past the sides of the pan) add batter and spread evenly into pan with a rubber spatula. Smoothing and pressing down as you go. Bake for 20-25 minutes until set. Remove pan from oven and let cool on stove for 15 minutes. Then gently lift bars out of pan using parchment paper and continue cooling on wire rack. When cool, move bars (using parchment paper) onto cutting board, and using a serrated knife, slice into 24 bars. Store in an airtight container, lined and layered with parchment paper.